A collection of nine stories explores human conflict, the impact of technology, and future tales of humanity's immortality. The nine stories in Greg Egan's new collection range from parables of contemporary human conflict and ambition to far-future tales of our immortal descendants.In “Lost Continent”, a time traveler seeking refuge from a war-torn land faces hostility and bureaucratic incompetence. 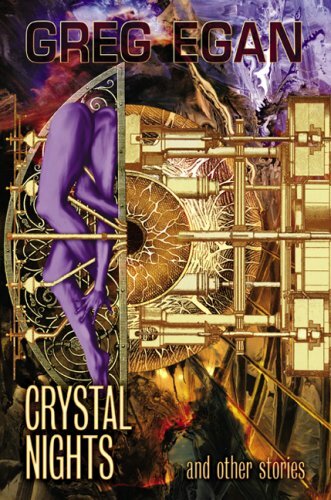 “Crystal Nights” portrays a driven man's moral compromises as he chases an elusive technological breakthrough, while in “Steve Fever” the technology itself falls victim to its own hype.“TAP” brings us a new kind of poetry, where a word is more powerful than a thousand images. “Singleton” shows us a new kind of child, born of human DNA modeled in a quantum computer—who, in “Oracle”, journeys to a parallel world to repay a debt to an intellectual ancestor.“Induction” chronicles the methods and motives behind humanity's first steps to the stars. “Border Guards” reflects on the painful history of a tranquil utopia. And in the final story, “Hot Rock”, two immortal citizens of the galaxy-spanning Amalgam find that an obscure, sunless world conceals mind-spinning technological marvels, bitter factional struggles, and a many-layered secret history.Greg Egan is the author of seven novels and over fifty short stories. He is a winner of the Hugo Award and the John W. Campbell Memorial Award.